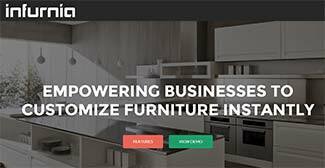 Bangalore-based startup Infurnia Furnishings Pvt Ltd has raised seed investment of $160,000 (around Rs 1.1 crore) from early stage venture capital firm Idein Ventures. As a part of the investment, Ashwin Srivastava of Idein Ventures will join Infurnia's board of directors. Infurnia enables consumers to visualise and customise their furniture in 3D before making a purchase. The new funds will be used primarily to expand the business model development, marketing, sales and technology teams. The company was founded in September 2014 by IIT alumni Nikhil Kumar, who was with Credit Suisse for two years, and Lovepreet Mann who has earlier worked with Deutsche Bank. Parul Jain, the third founding member, is an interior designer with more than 20 years of domain expertise. "Our room virtualisation tech will instantly create digital rooms in the same shape, size and colour as the actual room, allowing consumers to experiment with how different designs of furniture will look in their own room," said Kumar, who serves as the product head of the company. Idein Ventures was founded by Mumbai-based serial entrepreneur Srivastava, UAE based global investor Rajeshwar Prasad, and US based private equity expert and solution architect Mahesh Vellaboyina. Hyderabad-based custom-made furniture e-tailer startup Customfurnish.com allows its customers to tailor their home furniture by choosing the colour, size, design and style of their choice. Its software allows customers to change the design on models displayed at the portal. It recently secured about $4.5 million in a fresh round of funding from Bangalore-based family office Agnus Capital. Bangalore-based CapriCoast.com Home Solutions Pvt. Ltd, offers an online 3D catalogue besides customisation tools for its modular furniture. In December 2015, it raised $3.5 million (around Rs 23 crore) in a Series A round led by existing investors Accel Partners India and Singapore-based VC firm RB Investments. In September 2015, online furniture and home design services marketplace HomeLane.com acquired Doowup, a yet-to-be launched home dÃ©cor visualisation platform, for an undisclosed amount. Recently, Bangalore-based Livspace acquired YoFloor, a mobile platform that offers a virtual trial room facility for home designs. Idein Ventures Infurnia Furnishings Pvt. Ltd.